The week of your spring Ironman A race is upon you, what should you do this final week? After spending months putting in the long rides and extensive tempo work watching your power meter, tightening down your nutrition and getting used to the new equipment, attending yoga classes for flexibility and strength, it is time to put it all to the test. Hopefully, you have already begun to back off on the volume prior to this week, and kept away from the sniffling coworkers. If you have arrived this close to your big day, now is not the time to blow it by a few over ambitious moments in the days leading up to your Ironman race. First, relax! Sounds simple and obvious, but how many athletes do you see trying to squeeze in that final set of intervals or one last 60 mile ride early in the week? Now is the time to cut back volume, and add in some quality sleep. I have found that a three week taper allows enough healing from the biggest volume weeks, which are usually four to six weeks from the A race. For the average working age grouper, two weeks are okay, but three really gives an extra cushion to ensure full rest by race week. The overall volume is/should be approximately 25% of the highest volume training weeks (not including your race of course). Next, have all your flight, hotel, and car rental logistics complete well before the final week. Pack all your gear and clothes for the trip a week out, just in case the packing list you have is missing something it shouldn�t. It will give you a few days to throw anything else you need into your bags before leaving for the airport. When you do finally go to the airport, avoid touching common buttons such as the elevator, pay phones, hand railings and door handles. It sounds a bit paranoid, but use a tissue or handkerchief or shirt sleeve to touch public objects. After spending months getting ready for your march to fame on the world stage of Ironman, don�t blow it by picking up germs by being careless. Bring a bottle of hand sanitizer or wash your hands regularly, it may mean the difference between starting or not on race morning. From a mental aspect, stay ahead of the competition before the gun goes off by being positive. Race week can bring many doubts and questions. Did I do enough long runs or rides? Why does everyone look like they have 1% body fat and I don�t; am I not prepared for this? What if I bonk? If you plan out your nutrition in the months leading to your A race, followed a sound training plan, and take care of the logistics beforehand, you will be fine. Worrying about what you cannot control is wasted energy, and detracts from the focus of the A race before you. Trust in yourself, and let the dice roll where they may, because you have done all you can when the flurry of arms and legs begin when the cannon sounds. A basic plan that has worked well for my athletes� race week is a couple easy swims no longer than a half an hour per session. Realistically, a couple run and bike sessions with several five to ten minute Ironman race pace efforts in all disciplines early in the week will keep some �snap� in the muscles and prevent sluggishness. Two days out from the race, take completely off and lay out the race clothes, organize all transition bags, special needs, and dry clothes. Have a post race plan meeting spot with family or friends, including logistics for returning to your hotel. 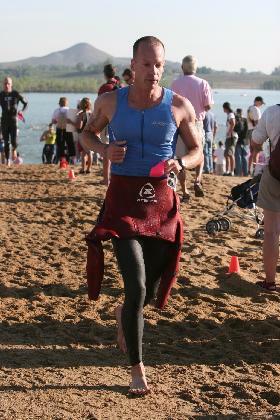 Pre-race day: try to swim/bike/run no more than 10 to 15 minutes per discipline. Just enough work to burn off any extra energy to curb excitement. Finish before noon; stay out of the sun and off your feet. Take a nap in a quiet room for some personal down time, without thinking about the race. Eat dinner before 6 PM so there is time to digest everything. The last thing you want to do is overeat the night before, and spend all morning in a panic while trying to empty your stomach before the start. This basic approach can be followed by anyone from the newbie to the experienced athlete. Not only will these tidbits of advice keep you from overdoing it physically, it will mentally allow you to relax and have a solid plan race week that has little stress, and keeps you in control for race day.